On February 2, 2014, a Duke Energy coal ash pit spilled more than 39,000 tons of toxic coal ash into North Carolina’s Dan River, creating an emergency and raising concerns about environmental and economic impacts for communities for miles downstream. Five years later, the fight to keep coal ash out of our waterways continues in North Carolina and nationwide as the Trump administration rolls back safety standards. Meanwhile, Duke Energy plans to continue burning coal in the state — and polluting rivers and lakes with coal ash — for the next 30 years! Coal ash is the toxic waste left over from coal-burning power plants and contains some of some of the most dangerous known chemicals, including heavy metals like arsenic, lead, mercury, and chromium. Exposure to these toxics raises the risk for cancer, heart disease, and stroke, and can inflict permanent brain damage on children. In North Carolina, Duke Energy filed Integrated Resource Plans that are meant to guide the company in identifying resources to meet the energy needs of its customers over the next 15 years. The company hopes to burn coal until 2048! What’s more, the plans do not even analyze whether Duke could save its ratepayers money by retiring its coal fleet sooner and switching to clean energy options. Considering how successful clean energy like wind and solar has already been across the U.S. and how much coal pollutes our air, water, and our climate — it’s appalling that Duke Energy’s plans continue to rely on coal. 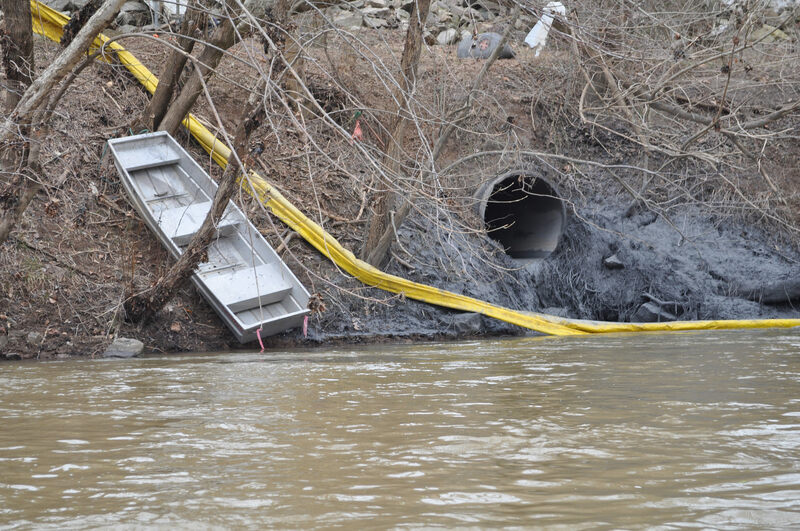 How many more times do we need coal ash to spill into our waterways? Duke Energy’s spill into the Dan River stretched 70 miles downriver and threatened the water supply for tens of thousands of people in North Carolina and Virginia. The Dan River coal ash spill site in 2014. Photo courtesy of Appalachian Voices. Five years after Dan River spill, coal ash continues to threaten communities across North Carolina. Duke is currently proposing to leave coal ash in unlined pits at six locations across the state, sites where groundwater contamination is currently happening. To make matters worse, Duke is pushing to force customers to foot the bill for this flawed “clean up” plan, rather than using a portion of the company’s billions of dollars in profits to clean up its own mess. Thankfully, communities are fighting back, packing hearings across the state in protest. Coal ash isn’t just a Duke Energy problem — in fact, there more than 1,000 coal ash sites in communities across the U.S. Thanks to new standards put in place by the Obama administration, starting in 2018 utilities like Duke were required for the first time to monitor pollution from coal ash sites and publicly post that monitoring data. The results have been jaw-dropping. Sixty-seven coal plants across 22 states in the U.S. report toxic contamination in groundwater at their coal ash impoundments that exceeds federal health standards, according to data from multiple utility filings obtained by environmental groups. We can do better than this, and many communities already have by shutting down coal plants and switching on clean energy. Of course, Trump and his fossil fuel cronies are furiously trying to eliminate those new national coal ash protections. Former coal lobbyist Andrew Wheeler is the acting head of the Environmental Protection Agency and is happily doing favors for his fossil fuel friends — including rolling back the Obama-era coal ash rule. Now we’re taking legal action against the Trump administration for gutting these standards, which are aimed at protecting public health and the environment. We demand better from Duke Energy and from Andrew Wheeler and the EPA. We must move beyond coal, and we must have strong standards in place to protect our families and the environment from coal’s toxic legacy.